Central exhibition panel for Behind the Lens: Raymond Pitcairn and Photography. Raymond Pitcairn is remembered primarily for two architectural achievements: Bryn Athyn Cathedral, and Glencairn, the Bryn Athyn home he built for his family and art collection. One of Pitcairn’s other creative outlets is less well known—his lifelong interest in photography. This hobby is the focus of Glencairn Museum’s current exhibition, Behind the Lens: Raymond Pitcairn and Photography (through November 15, 2014). The Glencairn Museum Archives maintains a large collection of photographic prints and negatives, including thousands of glass negatives. The images in the exhibition have been drawn from this remarkable resource. Figure1: Raymond Pitcairn with his camera at Glen Tonche. Raymond Pitcairn (1885-1966) became a serious amateur photographer in his early 20s, and maintained an active interest in photography throughout his lifetime. His large family was one of his favorite subjects, as was Bryn Athyn Cathedral, his most remarkable architectural achievement. In fact, it was his love of photography that led Pitcairn to his first architectural project: designing a studio across the street from Cairnwood, his childhood home. The studio, which still stands, featured a large room with skylights for posing his subjects and a darkroom for making prints. Figure 2: Carina Glen posing in the Cairnwood studio. In 1913 Pitcairn entered the Eighth Annual Exhibition of Photographs at John Wanamaker’s department store in Philadelphia. One of his entries, “An Illustration,” took second prize and a cash award (Figure 2). The subject was Carina Glenn, his sister-in-law, who had posed in the photography studio at Cairnwood. Alfred Stieglitz, today considered the father of modern American photography, wrote the foreword to the exhibition catalog and served as one of the judges. In March of 1915, Mildred Pitcairn, Raymond’s wife, sent a copy of his prize-winning photograph of Carina, her sister, together with a letter to Hubert Hyatt, Carina’s fiancé. The letter and photograph, now on exhibition, have recently been gifted to Glencairn Museum by Garry and Judy Hyatt. Figure 3: Mildred Glenn Pitcairn by the Cairnwood balustrade (c. 1910). Raymond was the eldest son of John and Gertrude Pitcairn. At first the family lived in Philadelphia, where four siblings were born: Walter, Vera, Thelemasou and Theodore. In 1895 the family moved into Cairnwood, a Beaux-Arts country house in Bryn Athyn designed by Thomas Hastings (of the prominent New York architectural firm Carrère and Hastings). John and Gertrude had their last child, Harold, at Cairnwood in 1897. When Raymond married Mildred Glenn in 1910 the couple moved into Cairnwood, where they raised a large family of nine children: Nathan, Gabriele, Ivan, Karen, Michael, Bethel, Lachlan, Garthowen, and Vera (listed eldest to youngest). In 1939 the family moved from Cairnwood to Glencairn, the home built by Raymond for his family and art collection. Most of Raymond’s family photographs were taken at Cairnwood, Glencairn, and Glen Tonche, the Pitcairns’ summer home in the Catskill Mountains. Figure 4: View of Bryn Athyn Cathedral from the valley (c. 1919). During the construction of Bryn Athyn Cathedral, Pitcairn, who supervised the project, was encouraged by architect Ralph Adams Cram to keep careful records. In 1913 Cram wrote to Pitcairn, “Why don’t you personally keep all necessary records of notes, letters, sketches, photographs of models, etc.” (Ralph Adams Cram. Letter to Raymond Pitcairn. 20 August 1913). Pitcairn planned to include the photographs in a book about the construction of the Cathedral. While Pitcairn himself wrote several drafts of such a book, the project was not completed until 1971, when E. Bruce Glenn, Raymond’s nephew, published Bryn Athyn Cathedral: The Building of a Church. (Pitcairn assisted Glenn with the early chapters, but he died before the book was completed.) This book featured many of Raymond’s historic images of the Cathedral’s construction, along with modern color photographs taken by Raymond’s son Michael, a professional photographer. Figure 5: Nathan and Gabriele Pitcairn posing with their father's camera box (c. 1915). Throughout his lifetime, Pitcairn made a point of keeping abreast of the latest technology in camera equipment and film developing techniques. One of his cameras, a Home Portrait Graflex, has been included in the exhibition (see lead photo, above). The name of the manufacturer on the camera, Folmer Graflex Corporation, indicates that it was made sometime between 1928 and 1946. Graflex cameras continued to be made until 1973. The other camera featured in the exhibition is an Auto Graflex which, according to family tradition, belonged to Mildred Glenn Pitcairn. It is likely that Raymond also made use of it. The Auto Graflex was manufactured by the Folmer and Schwing Division of Eastman Kodak (circa 1908 to 1923). Figure 6: Nathan and Vera Pitcairn on his twenty-first birthday at Glen Tonche (1933). Raymond and Mildred’s Graflex cameras have recently been gifted to Glencairn Museum by Alan Pitcairn, one of their grandsons. Alan was one of many family members with whom Raymond shared his passion for photography. In Biography of Raymond Pitcairn, Jennie Gaskell relates the following concerning Vera, Raymond’s youngest daughter: “When Vera was about ten or eleven years old and wanted to take some pictures, she was given a small, inexpensive camera. Raymond gave her some lessons on lighting and arrangement, showing her how to focus in order to get a complete picture. He then told her that if any of her pictures were good enough for extra prints or enlargements that he would pay for that. This gave her an incentive for trying to make a really good picture instead of just a casual snapshot” (pp. 204-205). 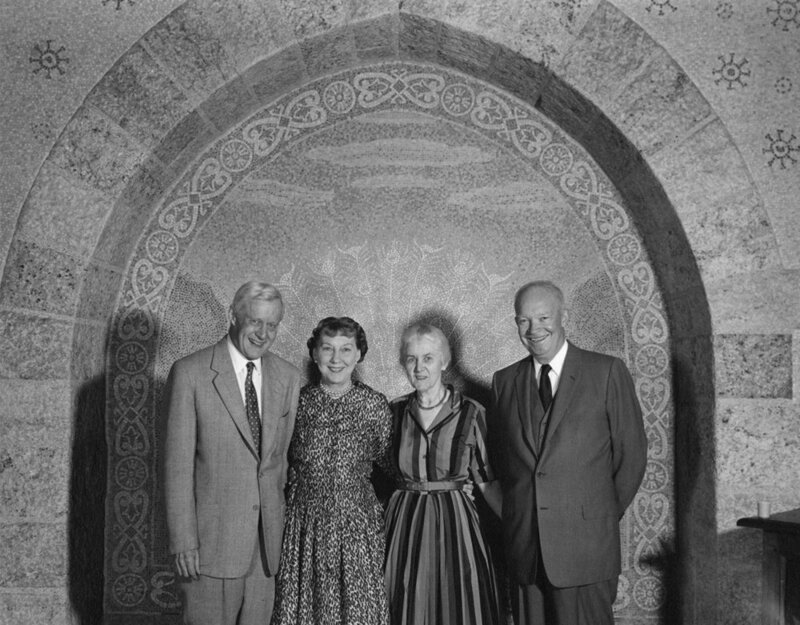 Figure 7: Raymond and Mildred posing with the Eisenhowers at Glencairn, 1961. Raymond Pitcairn’s efforts to share his enjoyment of photography with others extended beyond members of his own family. In September of 1955, President Dwight D. Eisenhower suffered a serious heart attack while vacationing in Denver, Colorado. He spent the next seven weeks in Denver, effectively running the country from his suite of rooms at the Fitzsimons Army Hospital. The Pitcairns were personal friends of the Eisenhowers, and Raymond wrote to Mrs. Eisenhower, offering their deep concern and sympathy. He also suggested that the President might find it diverting to pass the time by taking pictures with a flash bulb attachment for his stereo camera: “If the President from his chair or bed would use it to get snaps of his visitors, including you, I know his results would be amazingly good and he might find it fun.” The First Lady replied, “Your letter of prayerful concern over the President’s health warmed me, and made me more grateful for friends like you who are remembering us during this time of anxiety . . . Since he has always been interested in photography, he has quite a collection of flash bulb attachments for his camera, and delights in taking pictures of the mountains from the sun deck on warm mornings.” The two couples were later photographed together at Glencairn by the Pitcairns’ son Michael, during their two-day visit in 1961 (Figure 7). (Letters dated Bryn Athyn, October 12, 1955; Denver, October 28, 1955). Additional photographs can be viewed in the slideshow below. Karen Pitcairn Cole assisting with a photograph of Charles S. Cole. Harold Pitcairn after landing his Autogiro on Tonche Mountain (1933). Ivan, Gabriele, and Nathan Pitcairn making daisy chains (c. 1917). Quarter-inch model of Bryn Athyn Cathedral's tower on a bench (1918). Mildred Pitcairn and three of her children on the grounds of Cairnwood (1916). Glencairn Museum would like to thank Alan Pitcairn (grandson of Raymond and Mildred) for his generous support of this exhibition, including his gift of Raymond and Mildred’s cameras and the many hours he spent digitally restoring and printing each of the photographs.